The Rhode Island DOT TAMP is available here. The Rhode Island DOT TAMP fulfills and exceeds the minimum statutory requirements laid out in MAP-21, providing detailed information about all of the assets owned, operated, and maintained by Rhode Island DOT. While the required assessments of NHS pavement and bridge assets are included at the forefront of the document, Rhode Island DOT evaluated all of its assets in an effort to establish a comprehensive asset management strategy that prioritizes efficient data use and effective communication across divisions to pursue, achieve, and maintain a state of good repair for all Rhode Island DOT assets across the state. 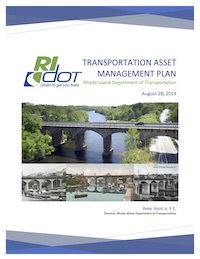 The TAMP provides performance gap analyses, investment strategies, and future plans to serve as a blueprint for progress over the next several years and to provide a foundation upon which Rhode Island DOT can continue to build, grow, and improve. This document includes the following sections: Asset Valuation, Current Methods and Tools, Data Management, Environmental Sustainability, Financial Plan, Introduction, Inventory and Condition, Investment Strategies, Lifecycle Management, Objectives and Measures, Performance Assessment, Process Improvements, Regulatory and Legislative Requirements, Risk Management. The asset scope of this document is: ADA/Sidewalks, Facilities - Maintenance, Fleet, Guardrail, Highway Assets, ITS, Includes other highway assets, Lights, Pavement Markings, Shared-Use Pathways, Sign Supports, Signals, Signs, Stormwater/Drainage.